(Phys.org)—There are many cool videos showing the Leidenfrost effect, which occurs when water droplets levitate and skid around on top of a very hot surface, rather than immediately evaporating like they do at temperatures that are not quite as hot. 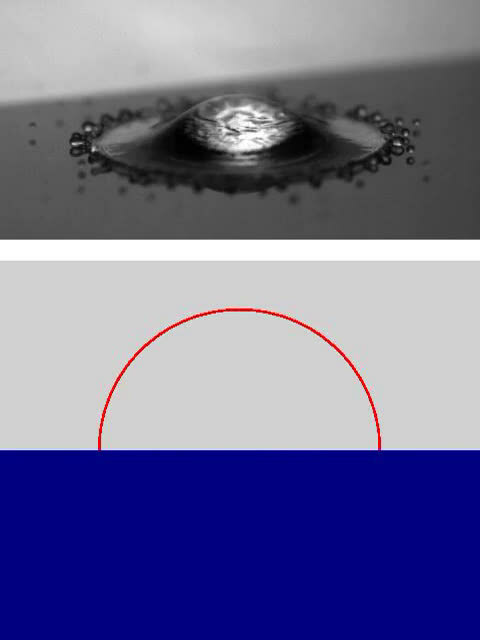 The effect occurs because the bottom of the droplet rapidly vaporizes as it approaches the hot surface, causing the droplet to levitate on top of its own vapor. 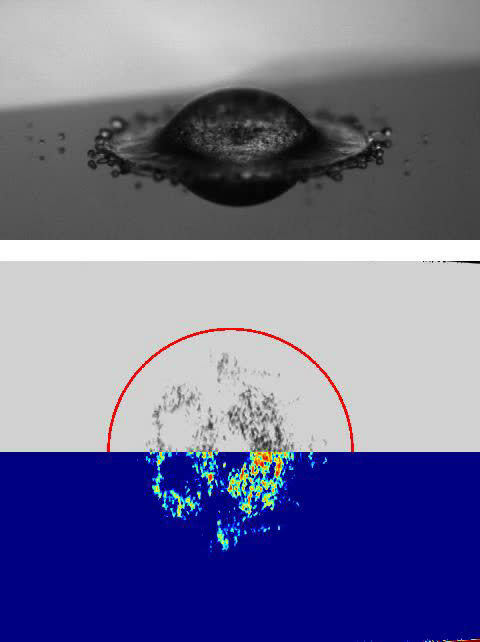 Now researchers have filmed the first videos of the tiny (less than 100 nm) levitation space between the hot surface and the impacting liquid droplet, in this case not of water but ethanol and fluorinated heptane. The videos allow the researchers to directly observe, for the first time, how the shape of the droplet base changes as the surface temperature approaches the dynamic Leidenfrost temperature. This temperature varies depending on the type of liquid and increases with the impact velocity of the droplet. The researchers, Minori Shirota, et al., from the Physics of Fluids group at University of Twente, have published a paper on their investigation of the dynamic Leidenfrost effect in a recent issue of Physical Review Letters. To film the levitation space, the researchers used a technique called total internal reflection (TIR) imaging. By reflecting a laser beam off mirrors and into a prism at a particular angle, the researchers could transmit the resulting laser light through the droplets. 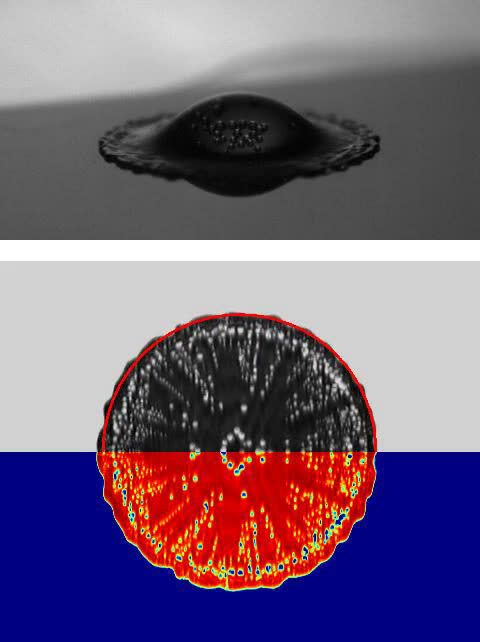 This procedure creates grayscale images of dark wet droplets that visibly stand out against the lighter dry area, allowing the researchers to see where the droplet comes in contact with the surface, if at all. One of the most useful pieces of information obtained from the imaging is that the shape of the droplet base is not flat, as sometimes assumed, but ring-shaped. The scientists describe it as a "dimple and neck structure" in contrast to the previous "pancake model" that describes a flat bottom. The pancake model cannot accurately describe observations, and its incorrect assumption of a flat droplet bottom may explain why. "Drop impact on a superheated surface is of key importance in various applications," coauthor Chao Sun, Physics Professor at the University of Twente, told Phys.org. "A quantitative physical understanding of the phenomenon is, however, lacking. In this work, we show that the whole impact dynamics is determined by the dimple and neck formation beneath the droplet at the very beginning of the impacting process." From the TIR images, the researchers could quantitatively define three different boiling regimes (contact, transition, and Leidenfrost) as the temperature increases at the various impact conditions. Previous research has loosely classified these three regimes based on somewhat superficial factors such as the number of tiny droplets ejected by the main droplet. Here, however, the TIR imaging allows the researchers to calculate values such as the incident angle and the spreading radius of the droplet in order to generate a clearer picture and a more precise definition of the regime boundaries and associated transition temperatures. The improved understanding of the Leidenfrost effect could have a variety of industrial applications. "Heat transfer from solid surfaces to impacting liquid droplets plays an important role in many industrial technologies such as power electronics cooling, spray cooling, engine performance, and pollutant emissions," said coauthor Detlef Lohse, Physics Professor at the University of Twente. In the future, the researchers plan to use their observations of the dimple and neck structure to develop more accurate models of the dynamic Leidenfrost temperatures for various types of liquids. "We aim to quantitatively and theoretically understand the dynamic Leidenfrost temperature, and plan to investigate the effects of the surrounding pressure on this fascinating phenomenon," said Sun and Lohse. You can see those droplets form on the hood of a car (from inside) during rain.